Ross Edgley, who has broken the record for longest sea swim. An adventurer attempting to swim round the UK mainland broke the record for the world’s longest sea swim off the Skye coast yesterday. Ross Edgley, 32, has completed 74 consecutive days at sea – swimming more than 1,000 miles through English, Welsh, Irish and Scottish waters without once setting a foot on land. The record, previously held by Benoît Lecomte for his 1998 record of 73 days spent swimming across the Atlantic Ocean, was broken south of Kyle of Lochalsh just after noon yesterday. 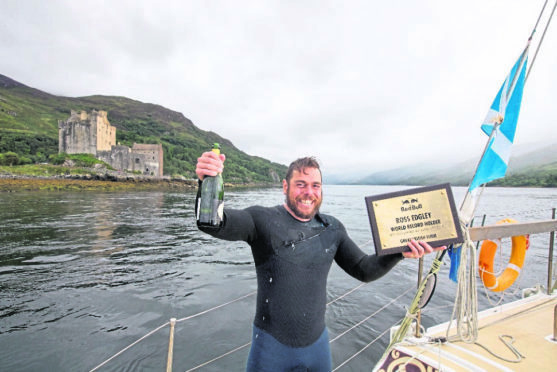 As he celebrated with world-famous Eilean Donan Castle in the background, Ross, from Grantham i Lincolnshire, said: “I feel an immense sense of pride, both for myself and the team – 74 days at sea is obviously no easy feat. “However, we set out to circumnavigate Great Britain and create history, so we won’t be stopping until we achieve that. “We are allowing ourselves to celebrate – but only for a moment. Tomorrow the tide changes and we’ve probably got another 900 miles to go before we circumnavigate Great Britain. He added: “As a team we were saying we could have done this faster. But, like Captain Webb swimming the channel or Edmund Hillary climbing Everest, this is about breaking new territory so the sport of swimming can collectively learn and we can pass on what we’ve discovered. Asked about his favourite moment so far, he added: “I’d say arriving in Scotland for so many reasons. “I’ve been brought cake, whisky, everything you can imagine really. “But also, Scotland represented such an important point in that once we got here, it meant we stood a chance of getting round the top, round John O’Groats, and back down the other side before the British summer ends and the winter really kicks in. Ross’s Great British Swim began in Margate on June 1. Consuming an incredible diet of 15,000 calories per day, Ross has continued to swim daily in six hour stints – resting on a support boat in between, all while having to combat jellyfish stings, wet-suit chaffing and a disintegrating tongue due to salt mouth.